Do you want to help make WordCamp Kathmandu 2019 a grand success? What better way than volunteering the event, right? If you want to be a part of the WordCamp Kathmandu 2019 volunteers team, now is the right time to do so. WordCamp Kathmandu 2019 volunteers’ registrations are now open. The official website of WCKTM 2019 announced the news yesterday. Volunteers are a vital part of making WordCamps grand and pushing it towards success. Be a part of the team to make WCKTM2019 amazing! It’s also a great way to get more involved with the WordPress community! 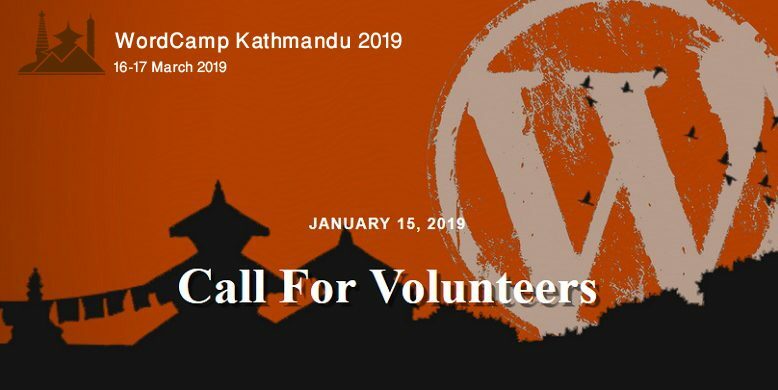 Who can be a WordCamp Kathmandu 2019 volunteers? Anyone with any background can volunteer. Not difficult until you enjoy it. What Does WCKTM 2019 Need Help With? Are you interested in being one of the WordCamp Kathmandu 2019 volunteers? If yes, head over to the Call for Volunteers on the official website and fill up the form given. Moreover, volunteers get a free ticket for themselves to WordCamp Kathmandu 2019. So, what are you waiting for? Hurry up and fill up the Volunteers form right away!! 5th February 2019 has been marked as the deadline to apply.